A wild, hilarious romp through the lands of fantasy! When Surge comes to Fey, new horrors are created. New races, new lands and whole civilisations suddenly appear. Living or dying by their own merits, these strange new arrivals have tuned Fey into a strange and vibrant world. But now, something horrible is happening. An unnamed evil, foretold by prophecy. A horrid evil. A really unpleasant evil! An evil so unspeakable that… that…. Well, we COULD speak about it, but then that would blow the plot! Look you really should just buy the book. How are you ever going to get to sleep now that you’ve peeked under the lid of this whole can of worms! 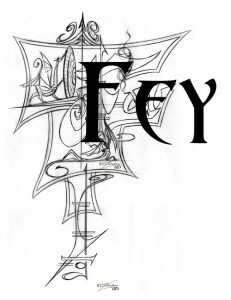 Fey: A rip-roaring spoof of the “High Fantasy” genre & publishing industry. A must for anyone who ever received a rejection slip, or who had to sit through someone avidly recounting their favourite crap fantasy novel.